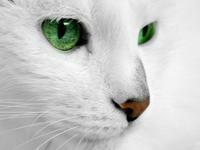 "I am aware that a cat can test positive for FIV if it has ever been vaccinated for this disease. Although I don't know much about Punky's history, it is highly unlikely he was ever vaccinated for it. I read that there is a second test called the Western blot test that can be done to confirm diagnosis. Given that there is little likelihood he was ever vaccinated for it, do you see any real value in having a second test done? My question then is, other than a cat having been previously vaccinated for FIV, are there any other conditions that might cause a false positive on a test for FIV." "I need to consider giving [Punky] some kind of protection, at least against certain common and usually fatal diseases such as FELV. From what I have read in a couple of places, it is not recommended to give vaccines that contain live viruses to a cat who may be immune suppressed. Do you agree with this? From my understanding, all vaccines that contain killed viruses contain adjuvants. Is this correct?I would really like to hear what your opinion is on giving vaccines to cats that likely have FIV and may already be immune compromised and what you would recommend." "Whether or not Punky has this disease, he will be continuing to stay with me, along with the other two kitties. My other immediate concern is regarding a decision on whether or not to vaccinate the other kitties for FIV.Are there any potential side effects from giving this type of vaccination? Also, how effective is this type of vaccination? Does this vaccine guarantee that they will not develop FIV from exposure to it? I noticed that in your article you indicated that the strain of FIV in Canada is clade C (I live in Winnipeg, MB Canada) and that the vaccine has not been designed or tested for this strain." This question has three basic sections. What does an FIV positive test mean? How do know the infection is real? If my cat is FIV positive, should I give my cat vaccines or not? Which ones are safe? Are any safe in an immune compromised cat? What do I do with the other cats of the household. Do I vaccinate them against FIV? How do I protect them? 1) The FIV positive test. What does it mean? The most common test for Feline Immunodeficiency Virus (FIV) is the ELISA snap test which is done either at the veterinary hospital or sent out to a reference laboratory. True positive, meaning the cat does actually have FIV and will have the infection for the rest of his or her life. False positive. This does not mean that the test "messed up" but that there are reasons for testing positive that are not related to having a true infecion. Maternal Antibodies. This only applies to cats that are less than 6 months of age4. Antibodiescan be passed through the milk to the kitten. These antibodies can lead to a positive test even though the kitten may never have ever come in contact with the virus itself. Cross reactivity. While reaction to other blood proteins is very unlikely, it can occur. This is one of the reasons why veterinarians will recommend Western Blot for confirmation. What is the Western Blot Test? Why run it? 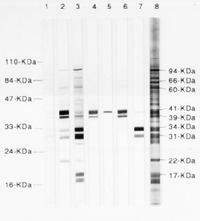 An example of a Western Blot test. The snap test done in the veterinary hospitals or those submitted to reference laboratory both employ a test method called ELISA. Both ELISA and Western Blot are special tests designed to look for specific proteins. An ELISA test will look for one specific protein while the Western Blot can look for many proteins. Without getting into specifics, when you run an ELISA test, you are looking for the presence of a blue dot or not (see the snap test in the frame above). The sample is sitting there and mixed with the test fluids. If the test fluid "catches" onto the protein it is looking for, then the blue dot appears. (yes this is greatly simplified). The problem is that while you see a blue dot, you are not seeing what the test fluid is specifically attached to. Luckily as these tests work very well; they are usually reacting to what we want them to. The Western Blot is a confirmatory test for the ELISA. This test has a couple advantages. First it spreads the protein across a plate, so only can multiple proteins be sought for but depending upon how they spread, you can confirm which proteins they are. Thus the issue of cross reactivity is solved. With FIV, they look for at least 3 FIV specific proteins. So why not start with the Western Blot? The cost difference is one reason. The other is that the ELISA is a little more sensitive. So ELISA is best to screen and Western Blot is best to confirm. There is also an IFA test. 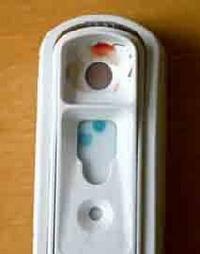 It is a good test but it is often used after an ELISA or in place of the ELISA test. Western Blot is generally superior to IFA for confirmation. Can Western Blot or any test distinguish between an FIV vaccinated Cat and a truly infected FIV cat? There currently is no practical method for distinguishing between a vaccinated cat and a truly infected FIV cat. This is one of several problems with the FIV vaccine. So why does the vaccine cause such problems? The vaccine is a killed vaccine which takes two different strains (also called clades) and inactivates them. They are broken up into pieces. The proteins become part of the vaccine from which the cat's immune system reacts to. Thus the proteins that we test for in the ELISA, IFA and ELISA are the same proteins for both the active, infectious virus as well as the vaccine. So what is the proper protocol for testing and confirming FIV? When the Snap Test is positive. The FIV vaccine. What are the pros and cons? FIV has five basic strains or what are called "Clades". The FIV vaccine was developed against clades A and D however was only tested against clade A. The efficacy shows that the test has a 82% against clade A. (This is where anything good about this vaccine seems to stop.) There is no information about whether the vaccine protects against clades D, B, C and F.
Furthermore, the vaccine is a killed vaccine. As a killed vaccine, it must employ the use of adjuvants (chemicals that cause local inflammation and help the vaccine work) unlike other types of vaccines. Most vaccine adjuvants are classified as grade 3 carcinogens. They can cause a severe form of cancer in cats that can develop as long as 13 years after vaccination. To read more: VAS Vaccine Associated Sarcomas. It provides 82%5 protection against FIV infection against clade A. For the other clades, FIV may provide some protection against infection. The test can cause a false positive on all current practical tests. Thus people may think that the cat is FIV positive when the cat just had a vaccine. Many people euthanize their cat if they test positive. Thus this vaccine may lead to the unnecessary deaths of some cats. The test can test positive for an undetermined period of time. There have not been a lot of conclusive testing; what we do know from tests is that 30% of cats will test negative at one year post vaccination. Many cats will test false positive for years after the vaccine. The exact duration of how long some cats can test positive after a single FIV vaccine is unknown. We know many will test for more then 4 years after. This may be one of the worst ones: the vaccine is a killed vaccine. Thus it is adjuvanted and can potentially cause a deadly form of cancer up to 13 years after vaccination. For these reasons, many veterinarians find the FIV vaccine to have more risks and problems than benefits. 2) Should I vaccine my FIV positive cat? Are Modified Live Vaccines risky? This is a fairly controversial. There are many veterinarians that will say no. There are also legal and regulatory issues to take into account with regard to rabies depending upon where you and your cat live. The health status and age of the pet is important. The owner's comfort level with vaccinations is important and finally the cat's risk/exposure level to diseases must be evaluated. It should be noted that because FIV is a non-curable, infectious disease that will shorten a cat's life, it is unethical to allow any FIV positive cat to roam outside where it may get attacked by another cat who could get infected. If everyone kept all the FIV cats in the world indoors, this disease would disappear within a decade, or decade and a half at most. So I will proceed with which vaccines you can give, in case your cat's situation requires it. If you use the Merial Recombinant Rabies, this vaccine is safe. It employs the use of a live canary virus which cannot exist within a feline cell. So there is no risk to the FIV positive cat. Do NOT use any killed adjuvanted rabies vaccines (just do not ever use any adjuvanted vaccines in your cat). Once cats reach adulthood, they naturally have protection against FeLV. It is also about 85% or so. This means that if you have a 2 year old cat who has never gotten a vaccine in his or her life, the cat has 85% immunity against FeLV anyways. Thus for adult cats, FeLV covers that small 15%. This is why I do not recommend it for cats that are indoors and older than 2 or 3 years of age. Since the FeLV vaccine by Merial is also recombinant, then it is also safe. This vaccine uses a needless device to deliver the vaccine. If the FeLV vaccine comes in an injection, it is adjuvanted and should NOT be used. In an online question in May 2009 on www.vin.com, this was answered with regard to this question, "MLV [Modified Live Vaccines] are safe [for FIV positive cats] but keep in mind that adult cats rarely need regular vaccination for R-C-P [rhinotracheitis, calici, panleukopenia]. No more often than every 3 years and if low risk of exposure, can go longer. -Craid Datz DVM, DABVP. In the same post, this was also stated, "I do not recommend killed FVRCP, even for retrovirus [FIV] positive cats. As Craig said, parenteral [injectable] MLV vaccines are perfectly safe. Do not use IN [intra-nasal] URI [upper respiratory infection / FVRCP] MLV vaccines as they can produce severe URI [upper respiratory infection] symptoms in retrovirus infected cats." - Alice M. Wolf, DVM, DACVIM, DABVP. So in general, the vaccines that are safe for normal cats are safe for FIV positive cats with the exception of the intranasal vaccines which are not recommended for FIV cats. However safety of a vaccine and whether your cat needs it or not are different issues. The ultimate choice is with you. 3) What about the other cats that live in a house with a FIV positive cat? How do cats get infected with FIV? Should the other cats in the household be vaccinated againd FIV? There are different opinions for this. Here are some thoughts that may help you decide on what choice is best for you. Vaccinating the other cats may provide protection against FIV infection if the FIV positive cat bites one of the other cats. However the problems with this are: 1) even with clade A there is a 18% gap (thus approximately one in five bites will still cause infection), 2) once vaccinated, it will impossible to determine if the other cats are infected or just vaccinated, and 3) it is adjuvanted vaccine and can cause cancer. The advantage to this is: 1) if the other cats do become infected, then the infection can be identified and the cat can be managed accordingly, 2) the cats are not exposed to adjuvanted vaccines. The disadvantage is that there is no protection against the infection that may be provided with a vaccine. Thanks Colleen and Punky for the excellent questions. I hope that many readers found this section helpful.